When we are in a responsible position where we need to get things done, we may have to push people. However, while pushing them, we may end up alienating them. To minimize such alienation, before being forceful, we can try to be resourceful. The Bhagavad-gita (18.43) lists the qualities of kshatriyas, the movers and shakers of society. Acknowledging that they need to sometimes use force, the Gita lauds their quality of not flinching from confrontation. Significantly however, that same list includes expertise too – they are resourceful enough to get things done by persuading, inspiring and stimulating people. This suggests that using force is just one among their resources, and they use it only as a last recourse. 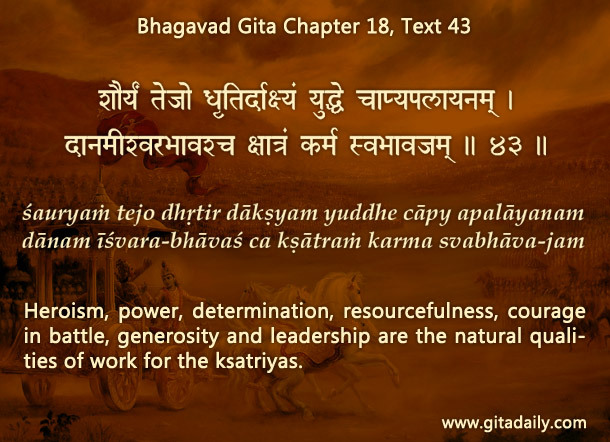 The Bhagavad-gita itself offers a divine example of resourcefulness.. Though Krishna, the Gita’s speaker is God himself, he doesn’t use his omnipotence to force Arjuna into compliance. Instead, Krishna chooses to be resourceful – he uses various cogent lines of thought and even demonstrates his universal form, all to inspire Arjuna to comply with divine will. When God himself is circumspect about using force to bend others to his will, we too need to be circumspect. Of course, when resourcefulness doesn’t work, forcefulness becomes essential, as happens when Duryodhana rejects Krishna’s peace proposal, thereby making the ensuing war inevitable. And we especially need to be resourceful while sharing spiritual wisdom with others. Choosing to become spiritual is a deeply personal choice. Forcing others to make this choice can lead to their doing it ritualistically or even resentfully, thereby defeating the purpose of spiritualizing one’s consciousness. Following Krishna’s example in sharing the Gita, if we too learn to be resourceful, we will improve our skills to express ourselves and persuade others; we will equip them to make healthier choices; and we will have richer and fulfilling relationships. How can we see force as one of our resources? How does the Gita demonstrate Krishna’s resourcefulness? While sharing spiritual knowledge, how can we be resourceful?